How are you and how are you enjoying summer so far? 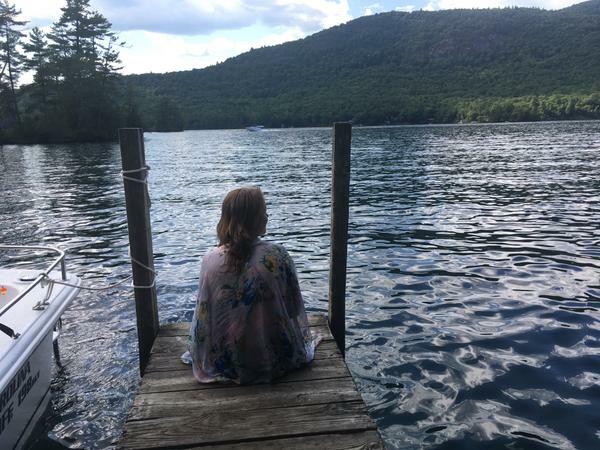 I took some relaxing time off to enjoy what I wait all year for – anything and everything which involves water. 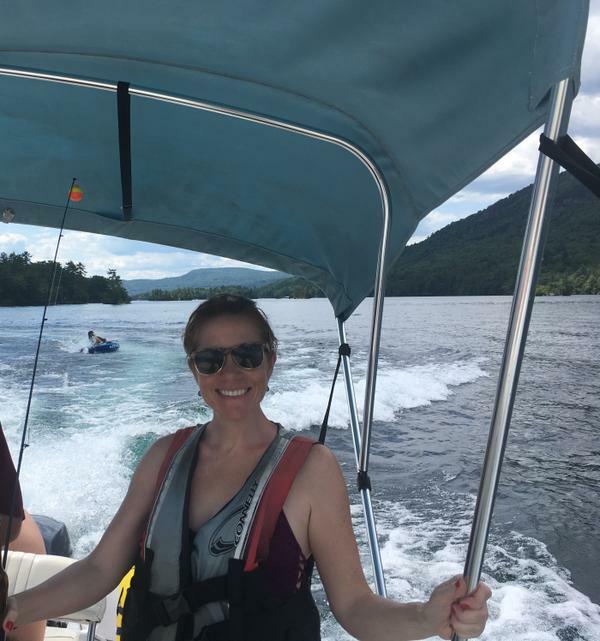 My family and I spent a vacation in the Adirondacks last week getting our fix in for lakeside living – sailing and swimming mainly. That’s my daughter in the background going gutsy surfing by tube behind us. 🙂 If you only knew how hard it was getting my kids out of that thing. Oh boy! Before I forget to share with you, this week I’m leading a coast-to-coast Gutsy webinar for Women in Public Finance, teaching some gutsy moves to become a thought leader with INFLUENCE. If you work in public finance and would like to join, learn more or request an introduction, drop me a line and I’ll be sure to put you in touch. Are you taking the time out for yourself this month and what you need? Although it was great being with loved ones, I also carved out my daily alone time to meditate. I know lots of people say meditation is good for you, but to be honest unless I understood what was in it for me, I never cared to try – that is until I began In Our Shoes, coaching professionals and being given the opportunity to speak to and empower audiences. Then I finally got it. I discovered meditation was a key ingredient to creating results quickly. I began creating the things that brought me most love and joy, working with beautiful souls like you everyday. Why? Because our intuitive spirit is always speaking to us and is impossible to hear in our day-to-day oh-so-busy world. Often we’re so focused on our external reality, that our inner guide is pushed aside even though it’s constantly whispering how to receive the things we want. Those gutsy whispers which come out of nowhere. For me they generally happen around water and so that’s where I migrate to as often as I can. Tapping into this quiet powerful energy doesn’t have to take that long and you don’t have to push so hard. You were placed on this earth with a small guidance system called your gut instinct for a very powerful reason. To create a life you love with joy. The only caveat is, you will always hit some contrasting experiences along the way which are purposely placed there to allow you to do one thing – CHOOSE. It’s not until you self-qualify yourself to deserve the things you want, that you eventually attract the things you want and turn away from what you don’t. Ever notice the tiny little word at the end of the word “attraction“. It’s called ACTION and that’s where you want to live and play. You can have all the knowledge there is, perfect any process, meditate all day – nothing happens until you go gutsy and take action, embracing you fear to find freedom. I created a whole system around this process which today is embraced by professionals and organizations globally. Nowhere else will you find mindset, intuition and energy practices combined with how-to proven business strategies that begin working shortly after starting MODULE 1. It’s an inside-out self-awareness spiritual and business blueprint to not just advancing in your career but in your life. Gutsy leadership is a lifestyle change which spills over everywhere. It’s not a confidence thing. It’s a commitment thing and if we’re being honest an investment in yourself. People invest in you once you make that investment in yourself. That’s how it works. Spend a day with me to get started. No travel required. Learn more here. Reach out to schedule a quick call through Grace to share where you are but more importantly where you want to BE. You set your GPS and tell me where you want to be, the rest is my job. With guts and grace, You deserve happiness and success. That’s a true statement not a question.